The department are delighted to have been awarded the Princes Teaching Institute mark for Geography again for our work during the 2014-2015 academic year and our commitment to developing outstanding teaching through a focus on key areas including the development and delivery of an extensive GCSE revision programme and increasing challenge within the curriculum. Back in September, 130 year 8 students took part in a fun-filled educational trip as part of our ‘Rivers’ topic. The day started at Brampton Mill, canoeing on the Great River Ouse. Students were able to see first-hand the different river landforms including a flood plain, river cliff and slip-off slope. Whilst clinging on to the canoes of their peers, students learnt key terms associated with rivers. This outdoor classroom provided students with a unique and valuable experience, really bringing geography to life! In the afternoon students went to Grafham water where they were involved in a team building challenge followed by orienteering. Building on the map skills learnt in Year 7, students were given a map of the centre and first faced the task of orienteering the map! Students showed real enthusiasm and thoroughly enjoyed their learning adventure! More photographs can be found on the school facebook page. 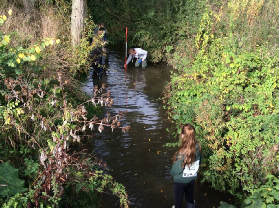 Early in the month our Year 12 Geographers were involved in two very successful days of fieldwork at the River Ise in Northamptonshire. Our students were studying downstream changes along the river and during their trip were testing hypotheses based on the fluvial geomorphological theory that they have been studying in class. This underpins their preparation for their AS Skills exam and has enabled them to develop important practice fieldwork skills. It was also another valuable opportunity for students to get out into the ‘outside classroom’ and a great time was had by all. 16 students from throughout the key stages have just entered the Royal Geographical Societies 'Young Geographer of the Year' competition. The theme this year was 'Why Antarctica matters' The competition required students to show independent learning skills researching Antarctica and producing an A3 poster (for A Level students an essay) summarising their findings and concluding why they think Antarctica is important. We would like to commend the students on their efforts and wish them luck with the competition. All entries have now been sent off the Royal Geographical society for judging but we will be publishing examples of their work on www.geobytes.org.uk and the department social media sites. The Geography department have long valued the use of new technologies to support online, independent learning and to celebrate the work of the department and our students. The start of the new academic year saw the launch of the new GeoBytes website (www.geobytes.org.uk) which acts as a portal for all online resources and provides support for all key stages. This is a continual work in progress and we look forward to seeing it evolve further over the next year as more content is added (suggestions welcome). 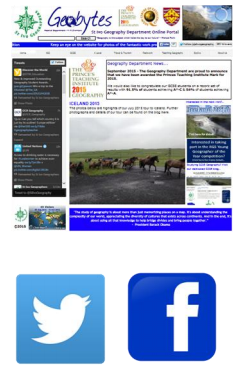 We are also making good use of social media to celebrate student work and activities and also providing links to geographical news stories and events to help students further their geographical understanding. The department twitter feed is @StIvoGeography and our facebook page is simply “St Ivo School Geography Department”. Both the Facebook and Twitter feeds are available through the GeoBytes website which means that students do not need to have a Twitter or Facebook account to still view posts and benefit from the information shared. Eco-Ivo members have been busy this term. A meeting and lunch at Hinchingbrooke School was a highlight where Eco-Ivo spoke to members of the lower and upper school about what can be achieved environmentally in a school. Eco-Ivo has nearly a decade of strong ecological best practice to share and Hinchingbrooke School were most receptive hosts. On the Open Evening on Thursday 8th October Eco-Ivo members manned Fairtrade stands on two sites in school; one in Reception and the other in the Geography Department. St Ivo is a Fairtrade school and has been for many years and we took this opportunity to celebrate by handing out cups of Fairtrade tea, coffee or chocolate. All that the members asked was that parents and families tried to buy at least one Fairtrade product when they went shopping. Eco-Ivo meets on Thursday lunchtime in N21 in Week B. We have had a lot of new members join - everyone is welcome! 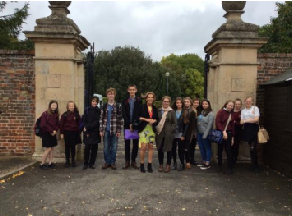 On Wednesday 7th October, 13 members of Eco-Ivo visited Hinchingbrooke, along with Mrs Morey and Mr Nunn, to help share the superb Eco-work undertaken at St Ivo. The students, ranging from Year 7-13, travelled to Hinchingbrooke with the aim of inspiring their students to take part and drive the Eco-work within their secondary school. It was a fantastic event seeing our students mixing with Hinchingbrooke's newly formed Eco-Warriors group, discussing environmental matters and the challenges of undertaking environmental projects in a large secondary school. The students were also enthusiastically disseminating advice to staff at the school and were invited to present in the sixth form assembly that afternoon. Several members of staff at Hinchingbrooke commented on how impressive Eco-Ivo were and were very keen for the group to further support them in the future. The students were a real credit to St Ivo!